It is quite funny that they think I am spreading biotech propaganda when the source is clearly not from the biotech industry at all rather from the Xerces Society. This is a nonprofit dedicated to looking at how to save the pollinators. Shouldn’t A’oles love that kind of group? I guess not. It just goes to show that A’oles do not read anything outside of anti-GMO propaganda and when faced with facts, they duck or run! These honeys show you exactly what they are made of! 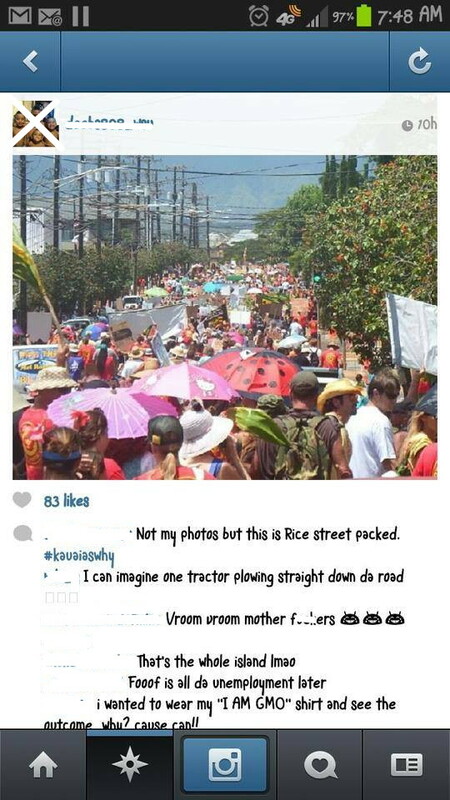 This entry was posted in No Aloha to Farmers, Uncategorized and tagged Agent Orange, Facebook, Genetically modified organism, GMO, Hawaii, Roseanne Barr, Twitter, Waikiki on September 30, 2013 by hawaiifarmersdaughter. The Crop Destruction Continues and the A’oles Come Out! One would think that if your group was associated with breaking the law and crop destruction, you would hang low for a bit. But no, not the A’ole GMO folks. They will come right out and state that they support this. Of course some of them feel the other way that this is a smear campaign against them which is odd because we’ve seen it all over the place. 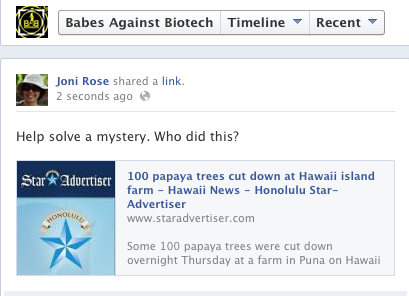 Read the Star Advertiser piece on Facebook with the details of the destruction of about 100 papaya trees in Puna. It is nice to know that a majority of the commenters on most of the articles did come out against this kind of action. 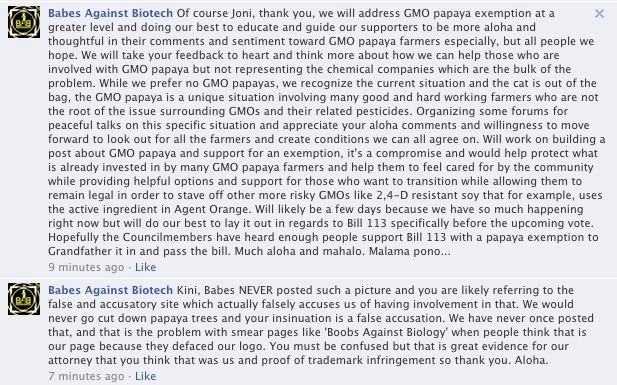 There is some hope that there may be a glimmer of aloha in the GMO issue. 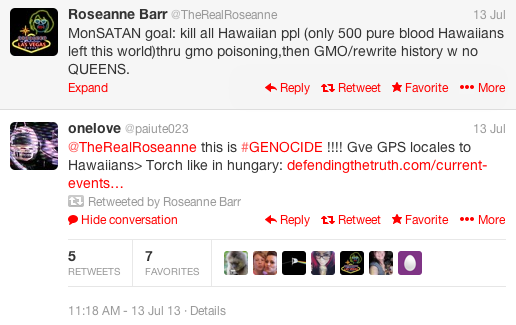 Just a reminder that when you are against GMOs, you are aligning yourself with these kinds of folks. The no aloha folks indeed. No farmer should ever have to worry about this kind of issue and it is not the individual’s right to support this kind of action. 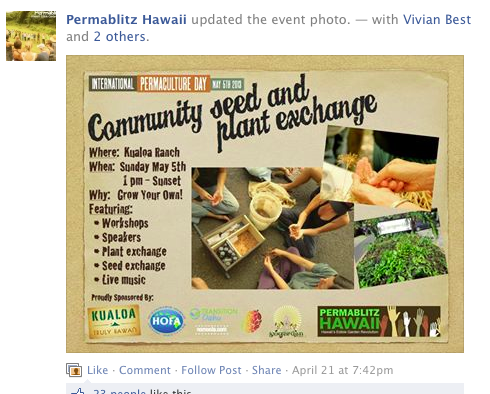 When the tone of the conversations change, that’s when we won’t need this kind of page exposing the no Aloha spirit. 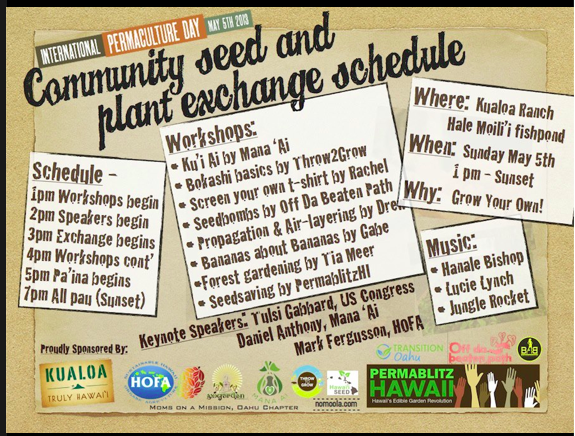 This entry was posted in No Aloha to Farmers, Uncategorized and tagged biotechnology, Brian Schatz, GMO, Papaya, Puna, Tulsi Gabbard on September 29, 2013 by hawaiifarmersdaughter. Glad to have worked w/@jontester on removing the Monsanto Protection Act from Senate CR. I urge the House to keep it out of the final bill. Yes, he too has not done his homework and actually read the bill but rather relied on the A’ole GMO club for his information. If Senator Schatz did a simple Google search of “debunk Monsanto Protection Act,” he would have been able to see that it is once again conspiracy theorists at work. And if you look carefully at who is pushing for this so called act, it is none other than the A’ole groups Food Democracy Now and the Center for Food Safety. No surprise! 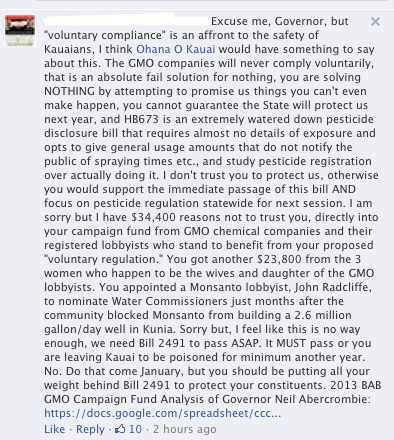 It’s a sad day in Hawaii nei when our own leaders fall prey to the fear mongers and hysterics of the A’ole GMO club. 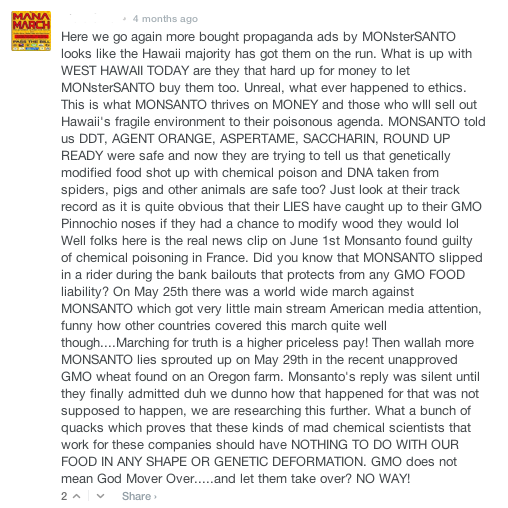 This entry was posted in The No Aloha Club and tagged Center for Food Safety, Food Democracy Now, Genetically modified organism, GMO, Google Search, Hawaii, Monsanto, Monsanto Protection Act on September 27, 2013 by hawaiifarmersdaughter. If you click on his link of the “proof” of the dangers of GMOs, can you guess what you get? Sadly, I got the debunked Seralini study. Little does he know that the author, Stephanie Seneff is not a biologist, geneticist, or even a molecular biologist but a computer scientist in artificial intelligence. Not only that but her so-called “paper” is published in the physical science journal Entropy along with her co-author Anthony Samsel, an environmental activist who is also a chemical engineer. Does Mike Gabbard not see any problems with this? If you simply do a Google search under “debunking Stephanie Seneff,” you’ll find out what’s wrong with her paper. Notoriously, the biggest of their debunked claims was that of a retracted study by Dr. Andrew Wakefield, listed as a reference. 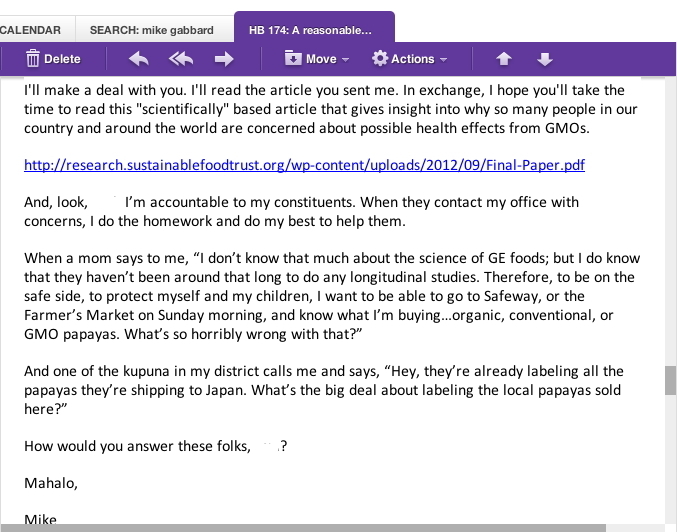 If you would like to know even more about Mike Gabbard’s stance on commercial farming, just do a Google search of “Mike Gabbard Organic Industry.” He’s been a long time A’ole GMO club member! No wonder he wants a label! He and his daughter, Tulsi, have also been active with the Hawaii Health Coalition that they founded and even received a $25K non-bid contract to spread their “healthy environmental messages” paid by taxpayers. It’s amazing how these leaders portray the “organic is superior” and “we are about saving the environment and nature” and so on bit but continue to associate with the most A’ole aloha people around! 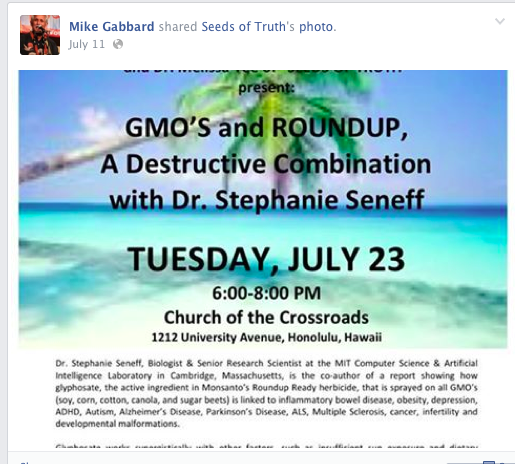 So as we can see Mike Gabbard is clearly an A’ole GMO club leader, and he supports the A’ole aloha folks who are so respectful and polite in how they express their views. 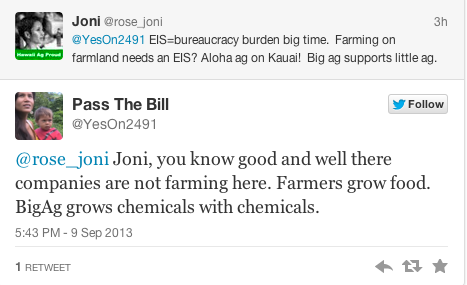 A’ole GMOs Claim No Aloha on Both Sides? 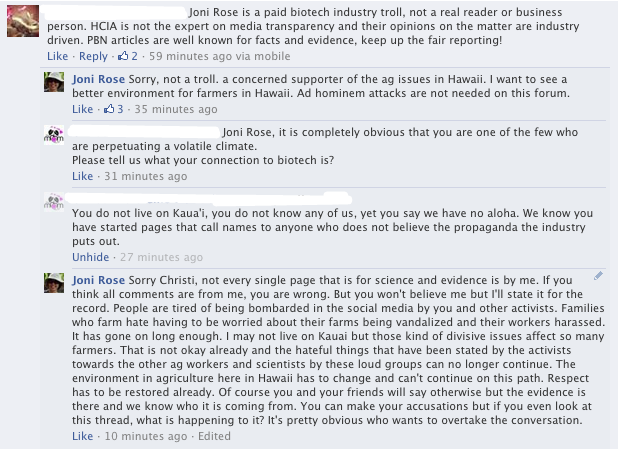 If find it very interesting that my blog is getting a lot of complaints on the social media by the A’ole GMO club, and claims that there is no aloha on both sides. I can’t quite figure out why a farmer would just come out of the blue screaming and sticking the finger unless something was antagonizing him to begin with, but that is yet another story. And why are you also bringing your young kids to an activist event where you know you’ll piss people off? Remember A’oles, that it just takes one bad misstep and your name will live in infamy to millions. Thanks to the social media, it will be perpetuated in eternity, so just don’t do that! Some of my favorite Kauai A’oles came a taunting the other night on the Pacific Business News post on Sept. 21, when I responded to the post pertaining to what questions would you ask the editorial board. I simply posted a question and this is what ensued after that. The A’oles hate when they think their forum is being infringed upon and when that happens, you get a nice name… Troll! Can I then say hypocrisy because the same accusers will frequently go on to pro-science sites and go ape crap all over it! It is amazingly odd that they want one to eat poison GMOs and then tell a person something enlightening and peaceful. What a tale of irony indeed! This entry was posted in No Aloha Commentary and tagged Editorial board, Genetically modified organism, GMO, Hawaii, Kauai, Pacific Business News, Papaya, Social media on September 25, 2013 by hawaiifarmersdaughter. A’oles Just Don’t Read but can Talk! When you haven’t had much education in science and research, it is easy to get correlation mixed up with causation. Some don’t bother to read the definitions either or take time to learn about what’s truly being said. 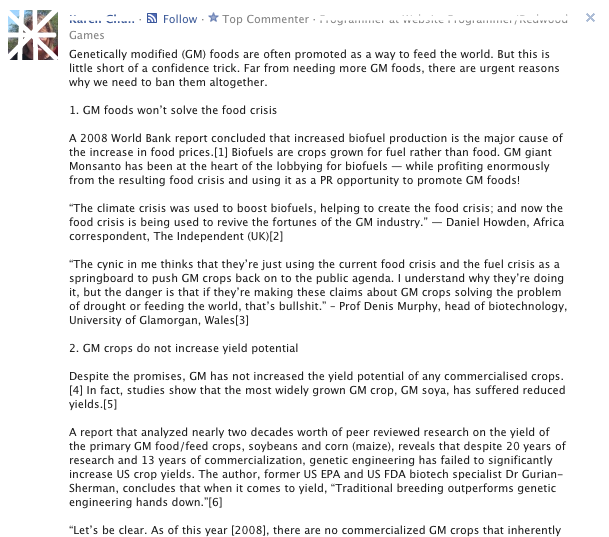 This opens up huge flaws in the A’ole GMO club’s arguments. Note, now really note and pay attention here, these two words are found in completely different sections of the dictionary. Why? Because they have completely different meanings. They are not the same as you can see from above. These A’oles will state that the increase in GMOs in our diets are the reason for increases in every single disease on earth. If that is the case, then that would mean the rise in production and consumption of organic foods would also be linked to increased disease. Well, that would fluster them all up in a forum so we’ll leave that aside for now. Basically, if something is correlated, it doesn’t mean that it is causative. One has to dig deeper to determine causation from a correlation. A’ole interpretation here: The longer your post, the less in will be based upon critical thinking and reasoning. Note that the blog link posted states clearly that the regulation of pesticides would be voluntary until the formal legislation is put into place. 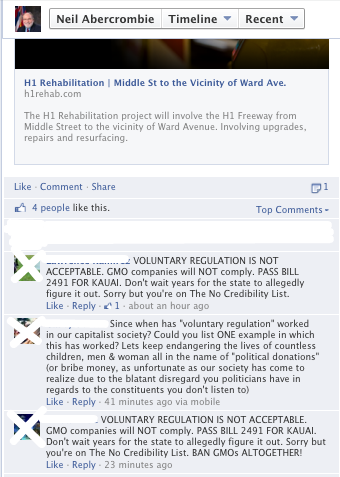 The A’oles obviously have no reading comprehension skills because they comment as if the whole law would be voluntary. Please read people, or you will be made the fool but we know that already. Yes A’oles, this is really sending the governor a strong message of what you’re all about and how you don’t think. And that is why you are an A’ole. 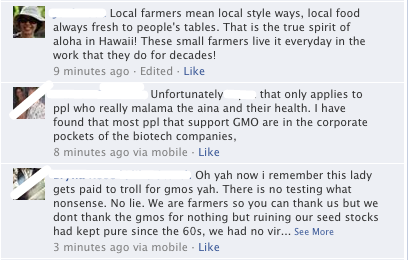 A’ole GMO means A’ole Aloha and A’ole critical thinking and reasoning. You’ve just shown that to the Governor tonight with how you’ve shown your exemplary manners and professionalism on his own official page. And you want him to listen to you after all of that??? This entry was posted in No Aloha Commentary, Uncategorized and tagged Correlation and dependence, Critical thinking, Definition, Genetically modified organism, GMO, Hawaii, Monsanto, Proportionality (mathematics) on September 24, 2013 by hawaiifarmersdaughter. I can’t quite figure out how chemicals grow chemicals because mine haven’t changed or grown yet. Unbelievable that GMO sources are being used to get Vitamin C. Vitamin C is also know as ascorbic acid. Where ever the source is, it will never contain GMO because it is a chemical as in all vitamins. Now where do we find DNA? Living things! He’s been reading way too much from the Organic Consumer’s Association. Interesting enough that so many A’ole GMO club members continue to state that GMOs are deadly when over three trillion meals have been served and not a single documented death or illness has occurred. That doesn’t happen in the other industry where deaths and illness have been happening more than they’d like to admit. How can this be??? 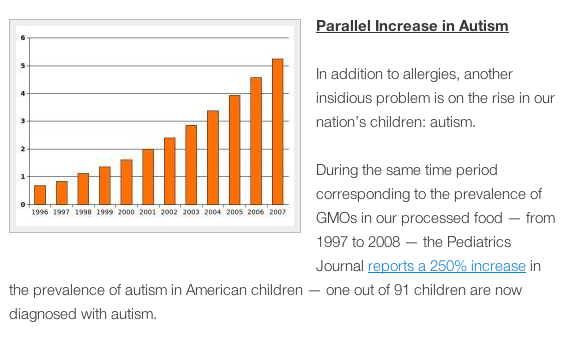 For one, if we say that eating GMOs makes one infertile, how in the world can biotech companies ever poison these children if they are never even born??? And if we were all poisoned by the evil companies feeding us GMOs, what good are dead consumers no longer alive and able to buy their products? Hmm… You poison your customers, make them infertile and dead, who’s left to fill the coffers of money? If you really want to know what’s wrong with this, learn from National Geographic’s article on genetics. There’s a great educational game on that page that each and every A’ole should do instead of reading Natural News and other bunk sites. Bt toxin and papayas eh? Let’s do some research about Bt and what its used for. It’s used to control a type of worm! So is it worms that are affecting the papayas? Uh, no, Mrs. GMO Free Mom! 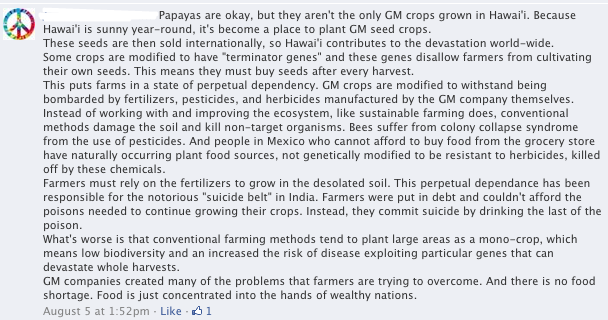 Do your research and you’ll find it is something else called papaya ringspot virus! 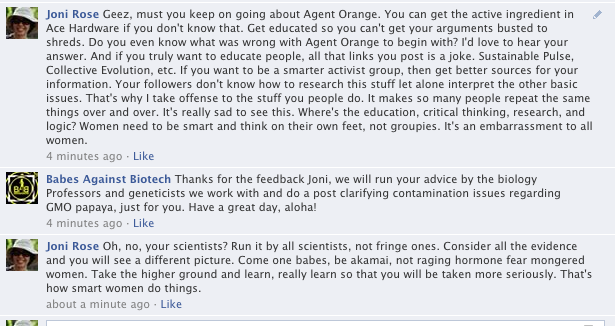 If you have very little knowledge about human digestion and physiology, please do not try to sound intelligent. If you don’t know the difference between fauna and flora, that is why you should not go on the internet and publicly shame yourself. 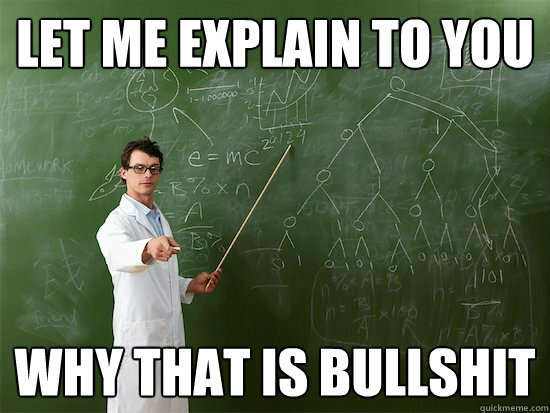 But then again, some people have no clue that what they are saying is complete nonsense. 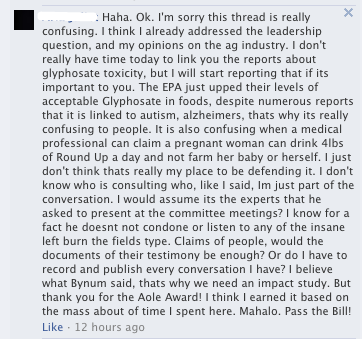 Thanks to Mike Gabbard for touting that ‘Roundup causes every disease on earth’ speaker. We are indeed making for an intelligent population. Of course, just the mention of GMO will cause a mass hysteria that there are GMO pineapples. 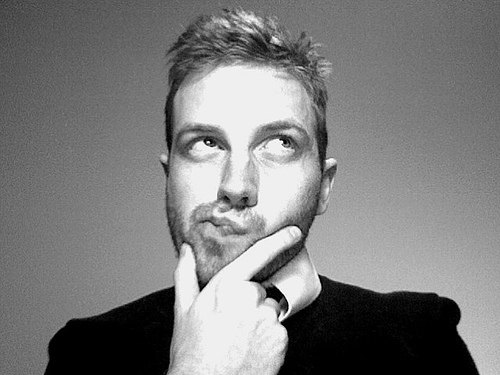 A quick search avoiding the A’ole sites will give you the answer. If you’re too lazy to click the link, the answer is that there is no commercially approved pineapples. I am starting to wonder if you are an A’ole demanding the “right to know,” what good would it actually do for furthering their knowledge? Many of them claim they already “know” everything about the dangers that GMOs represent because they’ve pulled all their “facts” from fear mongering propaganda websites. Then we find out that none of their claims actually stand up to legitimate scientific and fact-based scrutiny. And then we have the moronic and totally false comments such as the ones I just covered. Should we really be getting our dose of why we have a “right to know” from these folks? If you want to sound smart, then get educated about the issues and stop spouting off crank statements that then make others look ignorant and moronic when they start parroting the same hogwash. 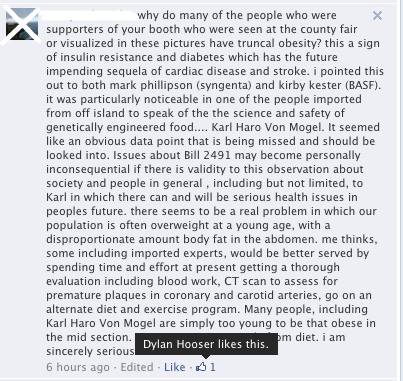 We also have a “right to know” if we are being misled by the anti-GMO fear propaganda machine. This entry was posted in Intelligence Quotient and tagged DNA, Genetically modified organism, GMO, Google, Hawaii, Mike Gabbard, Monsanto, National Organic Program on September 24, 2013 by hawaiifarmersdaughter.